In a wider sense, Wilkes Land extends further East to Point Alden in 142°02' E, thereby including Adélie Land, which is claimed by France. Wilkes Land is named after Lieutenant Charles Wilkes (later a Rear Admiral), the American explorer who commanded the 1838–42 United States Exploring Expedition. 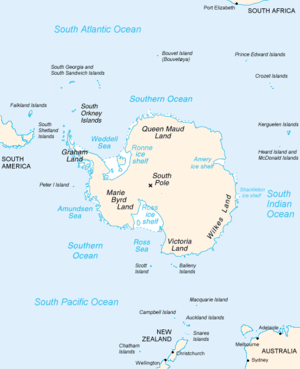 The naming is in recognition of Wilkes' discovery of the continental margin over a distance of 2,400 km (1,500 miles) of coast, thus providing substantial proof that Antarctica is a continent. This definition of extent excludes the area east of 142°02' E, George V Land, which was sighted by Wilkes but has been shown by later expeditions to be further south than the positions originally assigned by him. In 2006 a team of researchers led by Ralph von Frese and Laramie Potts used gravity measurements by NASA's GRACE satellites to discover the 300-mile-wide Wilkes Land crater, which probably formed about 250 million years ago. Wilkes Land is featured prominently in the 1998 film The X-Files. Fox Mulder journeys to Antarctica to save his partner Dana Scully, who is being held there against her will. In the process, they discover a huge secret lab under the surface run by the Cigarette-Smoking Man. ^ Stanton, William (1975). The Great United States Exploring Expedition. Berkeley: University of California Press. p. 175. ISBN 0520025571. ^ Gorder, Pam Frost (June 1, 2006). "Big Bang in Antarctica — Killer Crater Found Under Ice". Research News. Wikimedia Commons has media related to Wilkes Land.